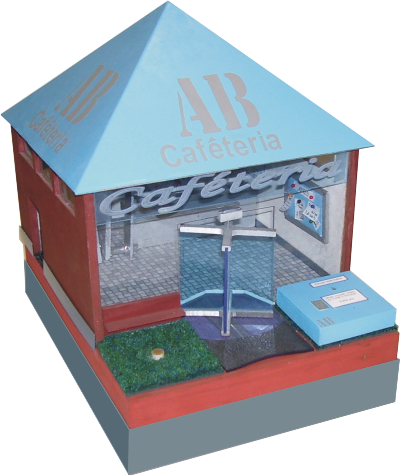 The model dining hall below has been fitted with four temperature sensors. They have installed to detect fire as the temperature will rise quickly when a fire takes hold. In order to check whether the system has working potential a spreadsheet has been produced that models the system. Two screen prints are seen below. The first shows sensors one, three and four showing false (no fire). 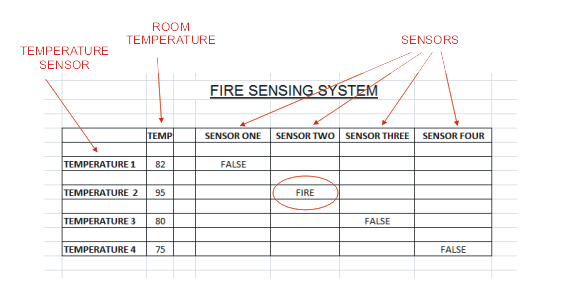 However, the room second sensor reads ‘FIRE’. This warns the security guard who has time to clear the dining hall of any people. The spreadsheet has been created with formulas. These are seen in the second screen print below. The formula used is very simple. For example sensor two reads the actual temperature in the TEMP row. If it is higher than 90 degrees then the word FALSE is replaced with FIRE. This models the possible real life situation. The same type of spreadsheet could be applied to calculate the number of people entering the dining hall or be used to calculate stock.